Adorable sugar cookies iced in striking colors are just the thing for a child’s birthday party, and I can’t think of a better way to mark such an event for someone special than with Disney-inspired cookies. At the request of Teresa Bonne, I created a variety of colorful treats for her adorable granddaughter’s third birthday. You see, for Elley, it’s all about the movie ‘Tangled’. The Rapunzel fairy tale recreated by Disney is the theme for her birthday party this year and so, for Teresa, she wanted treats evoking this movie for her guests that were bright, sparkling, magical and extra special. With this in mind and with a few images, I took the task of baking and icing several dozen cookies for her. Thankfully I had a little help. The inspiring baker & blogger, Sugarbelle, had the perfect cookies that she made back in 2012. Those extraordinary cookies became my templates for Elley’s cookies. I thank her tremendously for the inspiration and, above all else, for her creativity & artistry. I can’t tell you how much fun I had making these charming cookies. In the middle of icing the treats it struck me that certain things were coming full circle for me and for Teresa’s family. With two very special and collectible cookie cutters that I personally purchased from Teresa over a decade ago, I cut, baked & iced the largest of the cookies. I’ll save the little history behind those particular cutters when I show you the cookies. Take a look at the cookies that I made for little Elley’s third birthday. To personalize the cookies for Elley's birthday part, Teresa asked me to make name plaques, cookies with the number 3, and the letter 'E' for the guests. Using royal icing in a beautiful shade of pink and plain white, I kept the designs for these three cookies simple and delightful. Each letter was flooded with a solid color and left to dry; dots of royal icing were added along the borders. The name plaques were outlined in pink royal icing using a #2 tip and alternating dots of white & pink royal icing were piped in a symmetrical pattern. The numbers were simple: I outlined a number 3 in the middle of each cookie with royal icing and flooded it; the negative of the cookie was then immediately outlined and flooded in pink royal icing. Left to dry, the rounds were then given simple dots of royal icing. 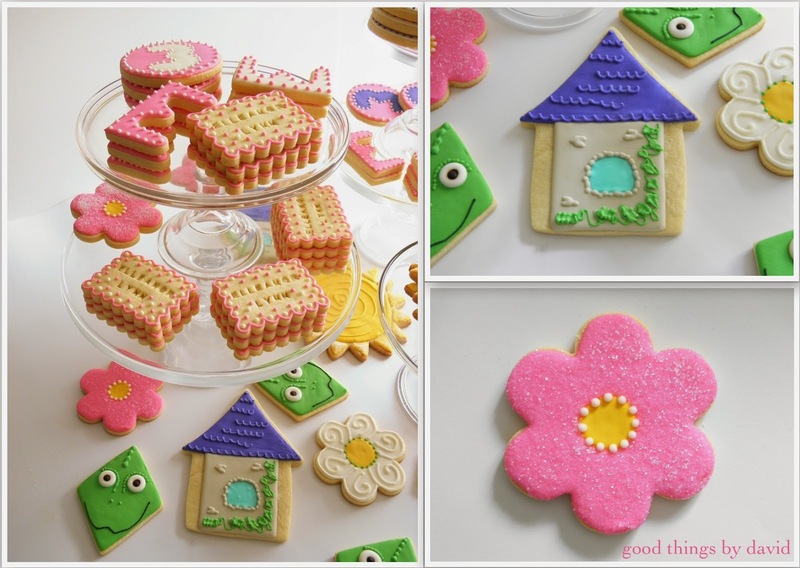 The charming tower cookies of Rapunzel were cut using the cottage cookie cutter from the Martha by Mail House & Tree Set. I simply removed the chimney with a sharp paring knife before baking. The roof of the castle was outlined and flooded with a deep lavender royal icing, while the tower was outlined and flooded with a 'stone' colored royal icing. These were left to dry. 'Roof tile' swags were piped in a haphazard fashion as were the blocks of stone on the castle. The window was flooded with an ice blue shade of royal icing and a creeping vine found its way up along the side. Small vine leaves were ruffled here and there with stiff royal icing. Rapunzel's little friend, Pascal, was straight out of Sugarbelle's post on the Tangled Cookies she created. I just love that little charming face. He was perhaps my favorite cookie out of the bunch. For the face, I outlined and flooded the base in apple green which was left to dry. Eyes were piped with white royal icing; hold your piping straight down and pipe out large mounds of white icing to the desired diameter, then add black dots. Dots around the eyes and down the forehead, along with two nostrils are piped with the same green royal icing. A black mouth is piped with a #1 tip. Whimsical pink & white flowers were iced in simple patterns and were either flocked with fine sanding sugar or were embellished with flourishes. Lavender number 3s were also included. In 2004 as the Martha by Mail catalog was closing, I realized that I did not have 'the essential' cookie cutters that had been sold in years past. I won several through online auctions back then. When I received my first set I realized that the seller was Teresa Bonne! I knew that her husband was the coppersmith who had produced all of the MBM copper cookie cutters, so I was thrilled to have these in my possession. Fast-forward to 2013. While talking to Michael Bonne when he came out of retirement, he asked me about certain MBM cookie cutters in my collection that I had blogged about. When I asked why, he mentioned that I had a lot of first-generation (first run) MBM cookie cutters; he should know, he created them! I then told him about winning them from Teresa back in 2004. As you can well imagine, this simply astonished him. He said to me: "those were from Teresa's personal collection that were original shop samples for her to test out in our home. At the time she was sad to let them go, but to know that you now have them in your home is a 'good thing'." Having first generation Martha by Mail cookie cutters directly from Teresa and using them to create several cookies for Elley's birthday party is a full circle moment or me as well as for her family. "I used first generation as a term to describe the earliest form or issue of an item. As in computers First Gen. would convey the idea that it's new, the latest, maybe first of its kind even. But improved versions came later. The very first star and moon set ever made, if placed next to the very last set that rolled off our production line would appear similar, would make nearly identical cookies yet some differences would be noted. First Gens. would show more earmarks of hand construction: wrinkles, hammer marks, slightly asymmetrical, heavier soldering, etc. So after the second year we developed advanced techniques to build the cutters so they became more and more " perfect" as time went on. This is why you see variations, however slight, in the cutters sometimes! The first dies were made by me. I formed the best shape I could by eye, freehand. Then soldered that copper band to a big flat square piece of copper sheet. Then filled it with plaster! Bolts ran through this down into a wood table. We pushed and hammered the copper cutter shapes into these primitive molds. We made 50 to 80 cookie cutters a day this way!" Placed into clear cellophane bags, each cookie was then carefully packaged to send via mail. cookies to make them your own for a future celebration. OK David. These are just too,too cute! I bet the kids loved them. Also,could you talk about first generation cookie cutters from Martha by Mail.I have never heard this term or knew there was a distinction. Love the cookies.LOVE your style. David, I can't stop staring at those cookies. They look divine and so darned cute! Can you do a future post on step-by-step instructions with photos for us? I'd really like to start making cookies like this, but I want a tutorial from you. Marion's Kid: I've asked Michael what this means exactly and I'm still waiting to hear back from him, so I'll let you know as soon as I do. Linda Fleischer: I promise to do a small tutorial on the basics of icing cookies. In fact, I should because I have a small demo I'm going to be doing in the near future! Marion's Kid, the explanation of First Generation cutters is now up! Well you are the answer man,David. Thank you for the clarification on first generation cookie cutters.